In-N-Out Burger wants to add another location in the South Bay, but Campbell city officials want to hear from the public about the proposal. Thom Jensen reports. In-N-Out Burger wants to add another location in the South Bay, but Campbell city officials want to hear from the public about the proposal. The popular burger chain is seeking to replace the existing Elephant Bar restaurant located at the corner of Hamilton Avenue and Almarida Drive, according to the city. Before reacting to the plan, officials have asked the public to pen their opinions about the idea on a forum posted on the city's website. As of Sunday morning, the forum had close to 90 statements. 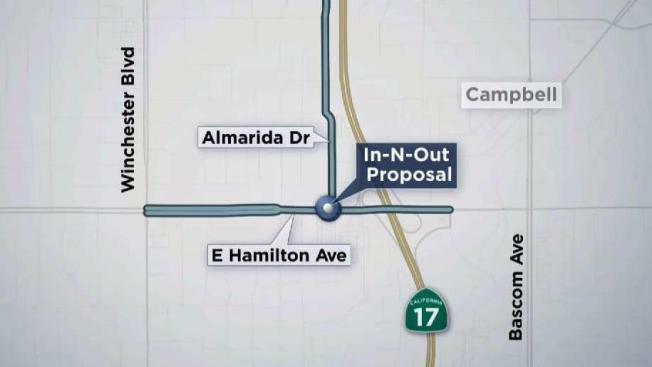 A handful of those comments decried the idea because of the potential traffic headaches the In-N-Out might create. Others like the idea because they wouldn't have to drive as far to dine at In-N-Out, and it would bring jobs and revenue to the city. In addition to listening to public feedback, Campbell city officials will also review the proposed plan and analyze the restaurant's impacts on traffic, parking, public safety, noise, lighting and air quality, according to the city. In-N-Out has three locations in San Jose, one location in Sunnyvale and one location in Santa Clara, but the company does not have an establishment in Campbell at this time. Anyone with questions regarding the proposal can contact Senior Planner Daniel Fama at danielf@cityofcampbell.com or 408-866-2193.